Installing or need cell & wifi booster installed in underground parking lot or multi-storey parking garage building? Get parking garage signal booster install service by expert installers. Cell Phone Signal Boosters Improve Consumer Confidence and Public Safety in Parking Garages and Underground Parking Lots. At one time or another, most of us have experienced the lack of cell phone reception in parking garages, and it can be downright annoying. And scary! Even if there is a cell tower located nearby, these underground parking structures are typically located right next to other large buildings and are constructed of materials like brick and concrete that repel cell signal. That in reality is a very serious public safety issue. Most users of parking garages and underground parking lots will admit that they don’t feel particularly safe using these buildings, especially late at night. Add to that the public safety issue that arises from a poor or non-existent cell signal which only adds fuel to their anxiety. Problems with Cell Phone Reception in Parking Garages. Do you regularly experience dropped calls or unsatisfactory voice quality in the garage of your building? Are you tired of seeing the "no service" error, preventing you from using your smart phone browser? The solution is actually quite simple! A commercial wireless signal amplifier can resolve all these issues. We're talking about public safety here, and there are a number of commercial-grade cell phone signal boosters designed specifically to ensure that both your tenants and members of the public feel safe in your building. We Are the Experts, and We're at Your Service! We will help you choose the right amplifier for your specific situation and complete the installation for you. With reliable wireless coverage in your parking garage, everyone benefits. Workers, security staff, and clients. Indeed, anyone using the parking garage will have access to strong and reliable voice and data. We have all become completely reliant on our phone's connectivity, and should there be an accident, criminal event, or health scare, these situations can become deadly serious when we're unable to access cell signal. It is the moral (if not legal) responsibility of all property owners and building managers to ensure the safety of their tenants and other users of their parking garage. Having a cell signal booster installed in a parking garage can avoid a potentially catastrophic situation, and it is such an inexpensive way of not only enhancing public safety, but offering peace of mind for anyone who uses your building. How Do Cell Phone Signal Boosters Work In A Parking Garage? Wireless signal amplifiers receive a signal from a cell tower located nearby. That signal is picked up by an antenna located outside the garage. The signal is then sent from that exterior antenna to an interior antenna located within the range of parking spaces, where the signal is boosted to its maximum strength. Cell signal boosters can be customized to cover any size large, multi-story areas. They are available in a range of sizes to suit the layout and square footage of any sized building. If you have a multi-storey garage, it could be that you will require multiple signal amplifiers (one system for each floor). However, ultimately, we can ensure that every single area of your parking garage receives strong, reliable cell signal coverage. The cell phone signal booster system should not be shared with any adjoining building, but be specifically dedicated to the parking garage. You may be thinking this is a lot of hardware. However, installing a cell phone signal booster system on each floor of your parking garage will be a lot more cost-effective than a DAS system, which can be very labor and cost intensive. Once you have decided to install a cell phone signal booster system in your underground parking lot of building parking garage, it is imperative that you speak to professionals in order to ensure that appropriate antennas are used. When providing reliable cell signal to any parking garage, warehouse, storage facility, or similar building, the use of outdoor directional antennas means they can be pointed to the nearest cell tower for maximum reception. Those send max signals to signal booster inside which amplifies those signals. Then they disperse strong signals via a network of distributed antennas, thus boosting the signal within parking areas where cars, trucks, buses etc. are parked. 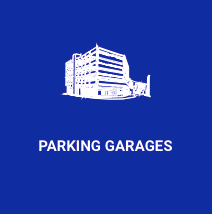 Take into consideration the needs for each level of your parking structure. Perhaps it is an open, above-ground structure, which probably means that there is less of a cell signal problem than an underground parking garage. However, your building would still benefit from the installation of cell phone signal boosters. Lower levels would require an enhanced signal, whilst levels higher up should receive a better signal. Keeping Tenants and Visitors to your Parking Structure Safe. It is very important that building owners and managers take responsibility for the public safety of their building's occupants and visitors. This simply means taking relatively inexpensive steps to ensure that, regardless of the location within the building or the time of day, people feel safe. Installing a bi-directional amplifier (BDA), distributed antenna system (DAS) or signal booster/repeater system will ensure that any phone over any network will receive a strong, reliable signal. A cell phone user will be able to commence their phone call indoors, enter the parking garage, then drive away from the building - without experiencing dropped calls when entering or exiting the garage. Our Specialist Technicians Know What You Need. Our network of highly trained wireless amplifier technicians are available to install the right signal boosting system for your building. We will recommend the right cell phone signal booster to enhance cellular connectivity to all areas of your parking structure. We're available right now to offer advice on how you can improve cell phone signal strength in your building. We know which model will suit your requirements, how many should be installed for top coverage, and how to determine the ideal locations for exterior and interior antennas. We will customize a cell signal boosting system for your parking structure and ensure all dead zones and other trouble spots are fully covered. Your tenants and visitors to your building will thank you for acknowledging and acting on their safety concerns. If you're working underground, our experts want to help you find the perfect underground cell phone booster system and install it to meet your current needs and specific environmental conditions. Submit your details for a parking lot signal booster installation quote, today.